In a large bowl mix pineapple juice, lime juice, and hot sauce. String about 4 to 5 shrimp onto a bamboo skewer. With a pastry brush, brush pineapple-lime chile mixture onto shrimp. 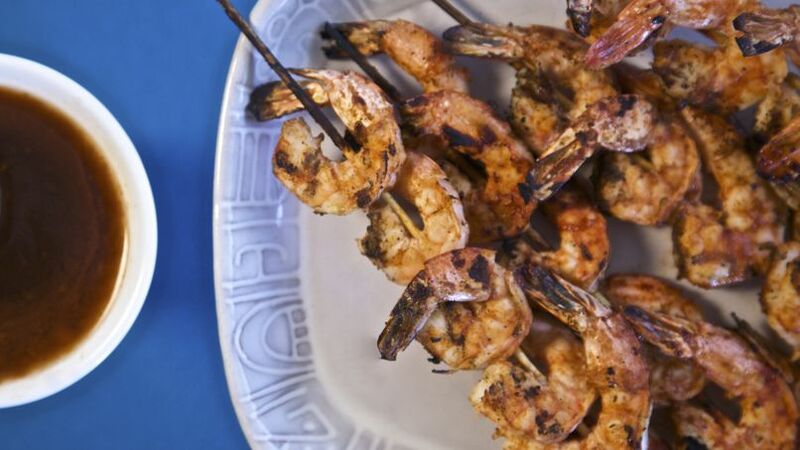 Place shrimp kabobs onto the grill and cook on each side for 5 minutes, or until fully cooked. Enjoy! This recipe goes great with an ice-cold beer. With summertime right around the corner, I can't help but imagine which recipes I'm going to make this year. I'll definitely prepare the traditional dishes I make every summer; but I'm also feeling a little adventurous! I came up with these grilled shrimp skewers after a little experimentation in the kitchen. It's nothing too fancy, but adding the chile lime and pineapple sauce makes this dish all the more exotic! Plus, this is a great summertime BBQ recipe that is super easy to make and an incredible crowd-pleaser.